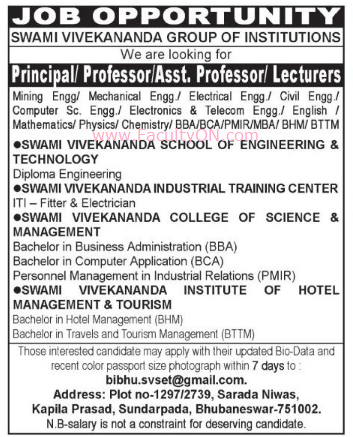 Swami Vivekananda Group of Institutions, Bhubaneswar has advertised for the recruitment of Teaching Faculty jobs vacancies. Interested and eligible job aspirants are requested to apply within 07 days from 23rd November 2018. Check out further more details below. About College: Swami Vivekananda School of Engineering and Technology made an humble beginning in 2008 through the establishment of an Diploma Engineering Institute in its Own Campus premises with only 100 students. Within a short span of time, it grew to become one of the finest Technical Education centre and having more than 1000 student in Odisha offering three year (Six Semester) Diploma Programme in Computer Science & Engg., Electronics & Telecomm.Engg., Mechanical Engg., Civil Engg. and Electrical Engg,Mining Engineering. It is approved by A.I.C.T.E., New Delhi and affiliated to S.C.T.E. & V.T. , Govt. of Odisha.